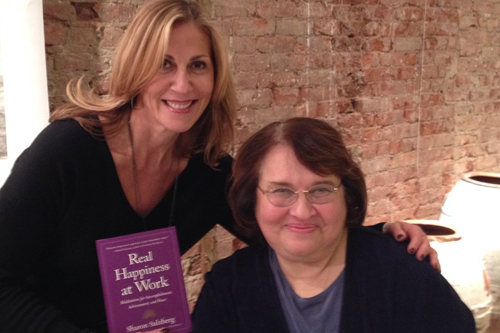 Here I am with Sharon Salzberg at a launch party for her new book, Real Happiness at Work: Meditations for Accomplishment, Achievement, and Peace. The room was stark white. Huge black-and-white photographs of elephants covered the walls. On tables between the white chairs and big colorful cushions, votive candles flickered, creating an air of tranquility. As I walked in I immediately felt like I was visiting old friends—and to my surprise I was greeted by a dear friend, Barbara Biziou. And then I made a few new ones. As Sharon Salzberg entered the room and took her seat, even her presence felt like om—a deep exhalation. We were all together in this space, and I was at peace. I’ve been an admirer of Sharon’s for many years. She’s one of America’s leading meditation teachers, a prolific author, and one of the founders of the Insight Meditation Society. But beyond her remarkable resume she’s dynamic and relatable and I always learn something new from her, so I was thrilled that the Garrison Institute was hosting a launch party for her new book, Real Happiness at Work: Meditations for Accomplishment, Achievement, and Peace (Workman), at ABC Carpet & Home. So many of the things Sharon shared helped me appreciate work as an opportunity for growth and change. Sharon began the conversation by asking the audience, “Can you remember a moment when you were really happy at work?” Her question made me think about some of the tough times I’ve had but also the wonderful ones, like when I was 19 years old and working in men’s accessories at Lord & Taylor during the holiday season. One day, in the chaos of lunch-hour shoppers, I searched the entire store to help a man find a gift for his best friend. To show his appreciation for my effort and patience he sought out my boss, brought him to where I was working, and told him what a great job I‘d done. It was a simple gesture, but it meant so much—and still does, since it has stuck with me for all these years!—because it gave my job meaning, a compassionate connection. So many of the things Sharon shared helped me appreciate work as an opportunity for growth and change. She told a story about when she was a young woman, newly returned to America after studying in India. Her meditation teacher had told her, “This is what you must do—teach.” So that’s what she did. Petrified of speaking in front of an audience, she eventually came to terms with the truth that it wasn’t about her, that her work had meaning and she just needed to step out of her own way. Once she made this realization she became invested in her teaching. How often do you need to remember to step out of your own way in work situations? I’m sure we all do. How great is that? “Madam, the traffic is not your fault. Nor is it mine.” Understanding those words didn’t just change Sharon’s day or her mood. They also illustrate what she means by the kind of experience that can give an event or action, like our work, meaning. When we’re able to disconnect from the negative influences in our environment (and most of these are in our heads), we’re able to disconnect from the emotion of that discomfort. We can stop getting so caught up in our own thoughts of what we think we know—like what is causing the traffic, whose fault it is, or how we can get out of it—and start seeing what really is. I picked up my copy of Sharon’s book, excited to learn more ways we can take care of ourselves by establishing and replenishing our “culture of wellness.” But for the time being I’d learned a lot and headed home inspired and rewired.